CATHEDRAL CITY, Calif., October 9, 2018 – Construction for the Cathedral City High School’s solar power system began last night. 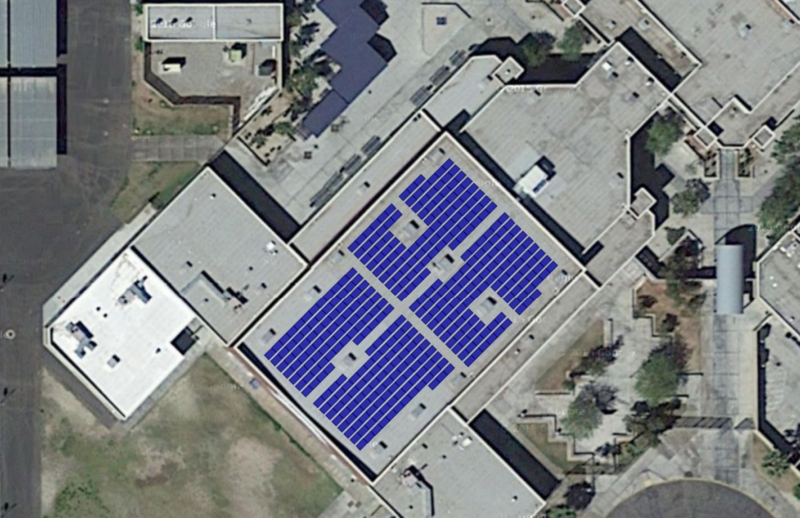 This exciting solar power addition to the high school was in response to the opening of the school’s long-awaited swimming pool. After 26 years of bussing the Cathedral City High School (CCHS) aquatic teams to and from the Palm Springs aquatic center, it was finally time for the CCHS Lions to train for swimming and water polo in their very own school pool. However, the school administration noted that the added benefit of a new pool on the CCHS campus would also bring added electric utility costs. To help relieve this new financial burden, Sullivan Solar Power will install a customized solar power array specific to the needs of the school. This state-of-the-art system utilizes a low-profile design, which keeps the system’s height shorter than the gymnasium’s parapet wall at all points. This design will allow for an aesthetically pleasing finished product while maintaining the expected production of the system. We were fortunate to work with the district and offset much of these added costs with solar power, so the pool would not become a financial burden. The solar project consists of 319 high performance SunPower solar modules which will generate 177,794 kilowatts per year. It will offset more than $57,000 in utility costs annually and includes a full twenty-five-year product and workmanship warranty, as well as Sullivan Solar Power’s own ten-year production guarantee. For more information about Cathedral City High School, visit www.catcityhigh.com. For additional details about solar power and cost savings due to swimming pool additions, visit www.sullivansolarpower.com. Sullivan Solar Power is a turnkey solar system provider that delivers solar electric projects from concept to completion. The company has installed more than 75,000,000 watts of solar power ranging from small-scale residential to large-scale commercial and municipal systems. Sullivan Solar Power was founded by Daniel Sullivan in 2004. Sullivan Solar Power has a longstanding A-plus rating with the Better Business Bureau, with no complaints filed since the business began. The firm has been named one of the fastest growing energy companies in the nation by Inc. Magazine and services all Southern California. Sullivan Solar Power was voted San Diego Union Tribune’s Best Solar Power Company of 2016 as well as a finalist for best alternative energy company for Press Enterprise’s Best of Inland Empire in 2017 and 2018. Regardless of project size and scope, Sullivan is committed to delivering the best products and the most qualified professionals to its customers. Visit www.sullivansolarpower.com or call 1.800.SULLIVAN for more information. Next articleAlaffia Founders Receive Corporate Excellence Award in Washington, D.C.